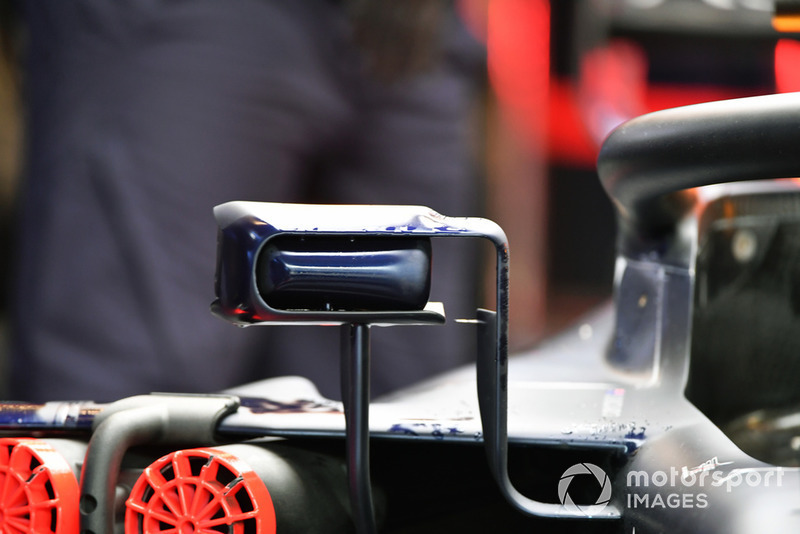 The RB14 continued to carry the DNA of Red Bull’s previously successful cars, as it pressed on with the same title-winning chassis philosophy, only making alterations in order to comply with the prevailing regulations. 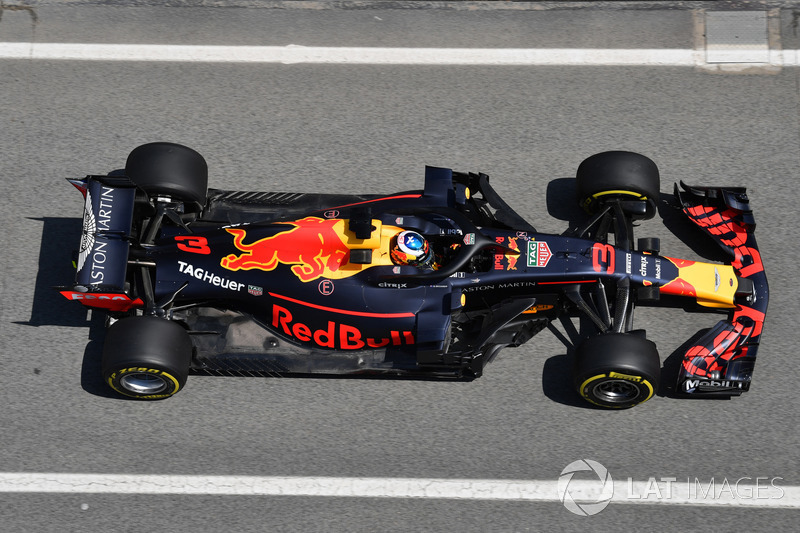 Red Bull’s belief in its ability to create the best car often led to criticism of engine supplier Renault, which has struggled in comparison to rivals under the hybrid regulations. This season can be seen as somewhat of a transitional year for Red Bull then, as it makes the switch to full-factory Honda power for 2019, a move which it hopes will truly catapult the team into a three-way battle for supremacy. Before we get there, let’s take this opportunity to delve into the image archive and discover the technical intricacies of this year’s machine, to see what made it so good. 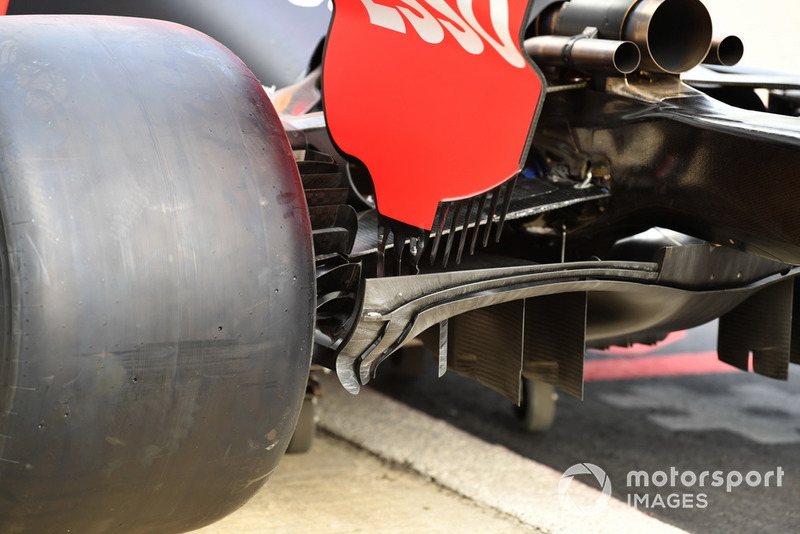 A close-up view of the bargeboards and under-nose turning vanes show how they’re connected together in order to improve rigidity. 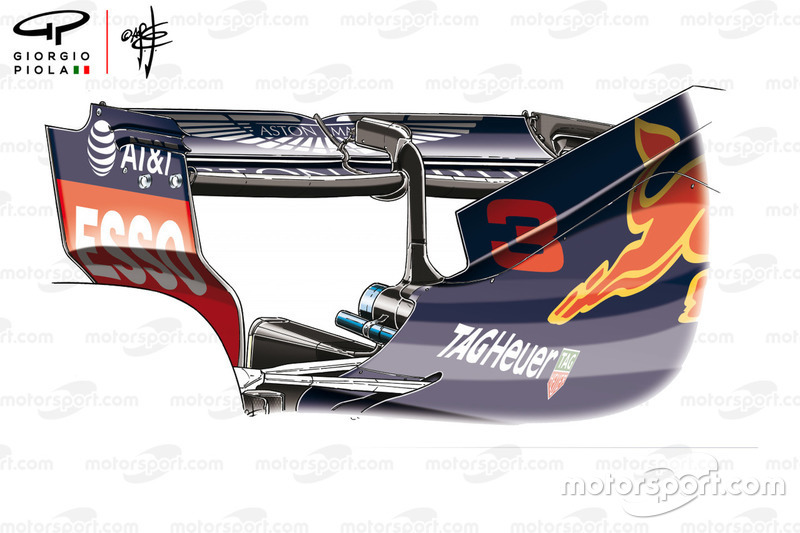 Red Bull was the only team to retain a streamlined version of the halo version, opting not to use winglets or other paraphernalia in this area. 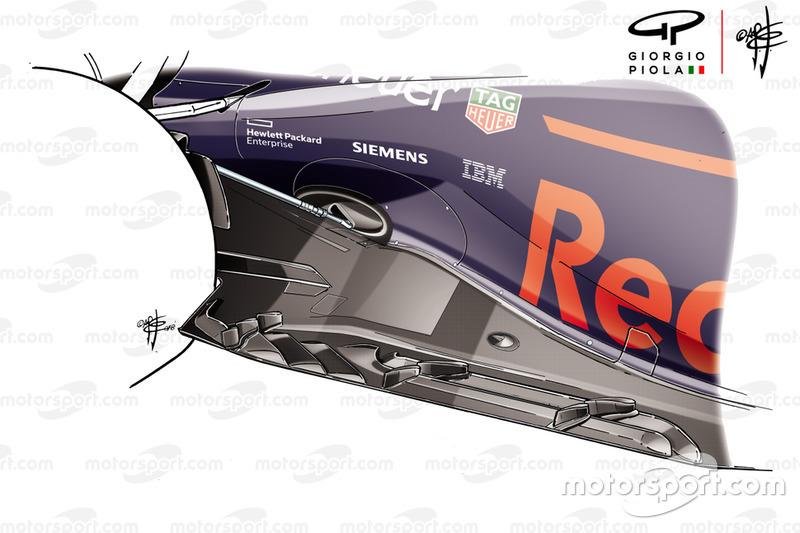 This image shows how far back the RB14’s sidepod inlet is, which is possible due to the overhanging bodywork seen above and below it. 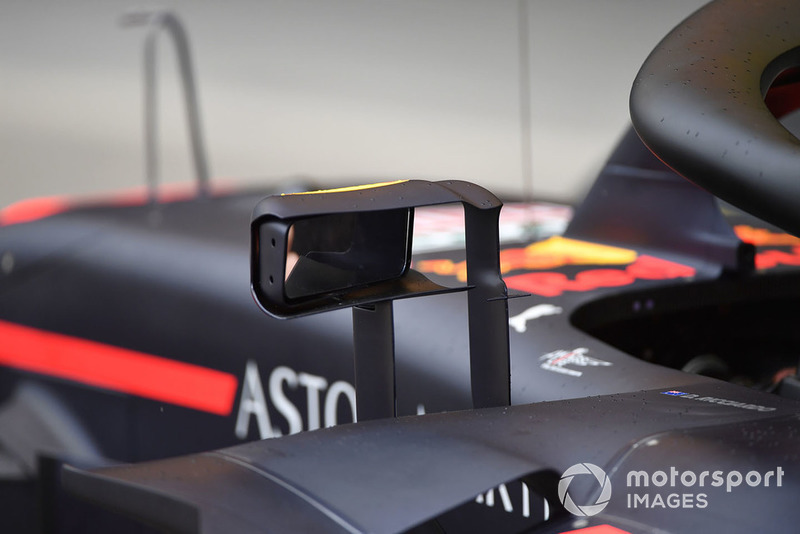 A nice view of the two-piece mirrors that the team introduced during the season, taking inspiration from title contenders Ferrari. A rear view of the assembly shows just how much more aerodynamic license became available when the mirror was considered as two separate parts. 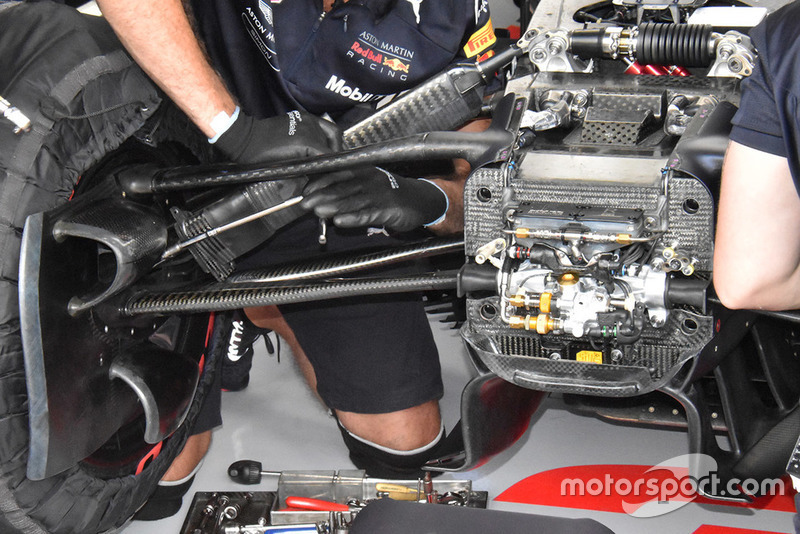 Mechanics make adjustments to the RB14’s front suspension, also note the teams use of belleville springs on their ‘heave’ damper. 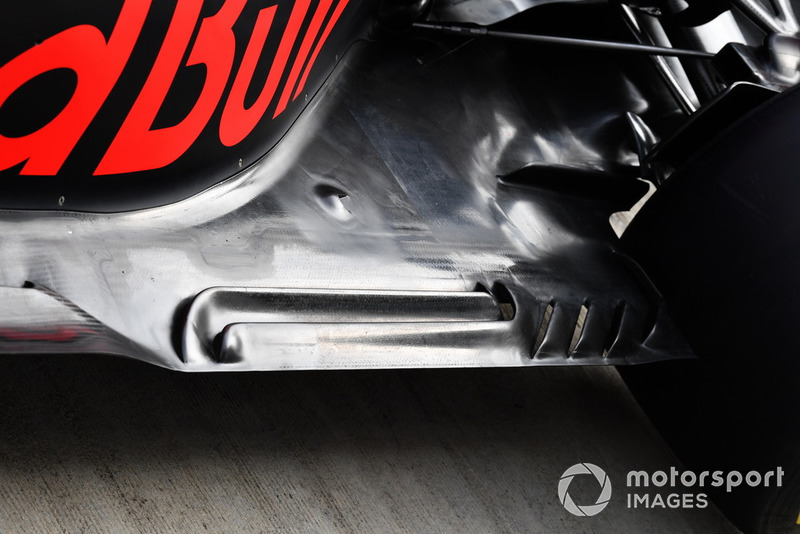 In comparison here’s a shot of the RB14 at the early stages of the season when the team used a hydraulic ‘heave’ damper. 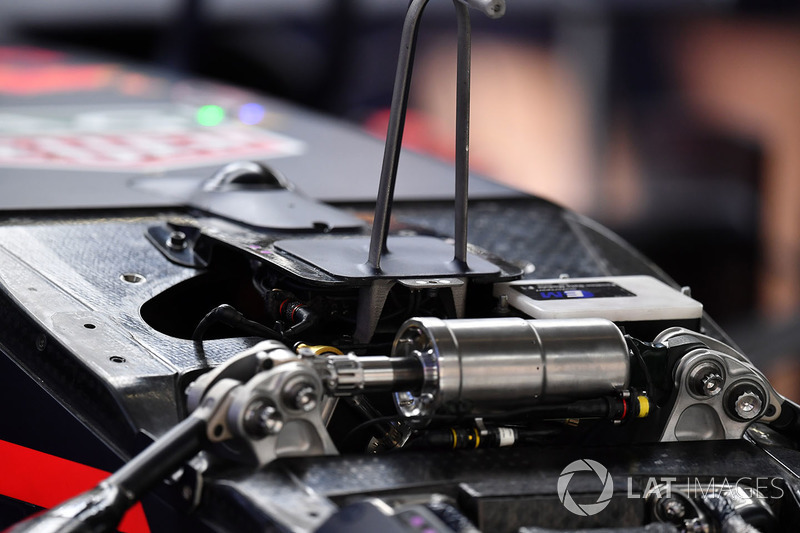 The RB14’s rear brake drum was treated to a heat-resistant surface, in order that the relationship between it and the rear wheel rim be at an optimum. 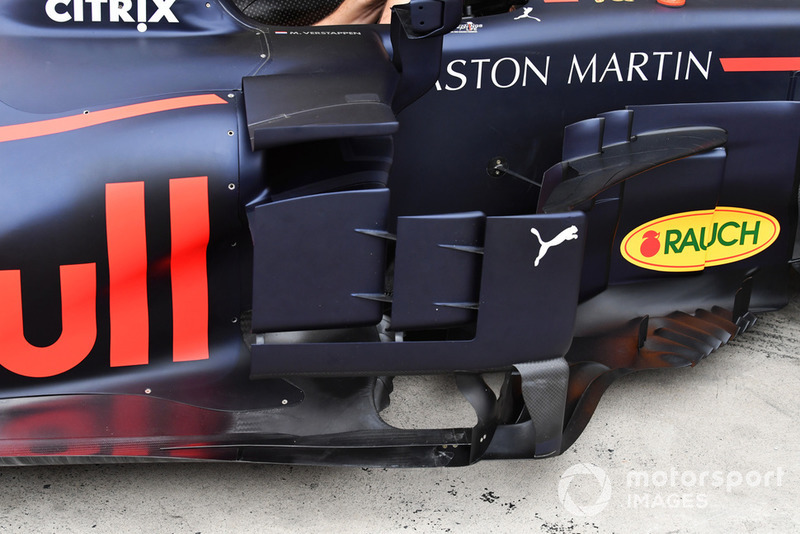 A great side view of the RB14’s bargeboards and sidepod deflectors. 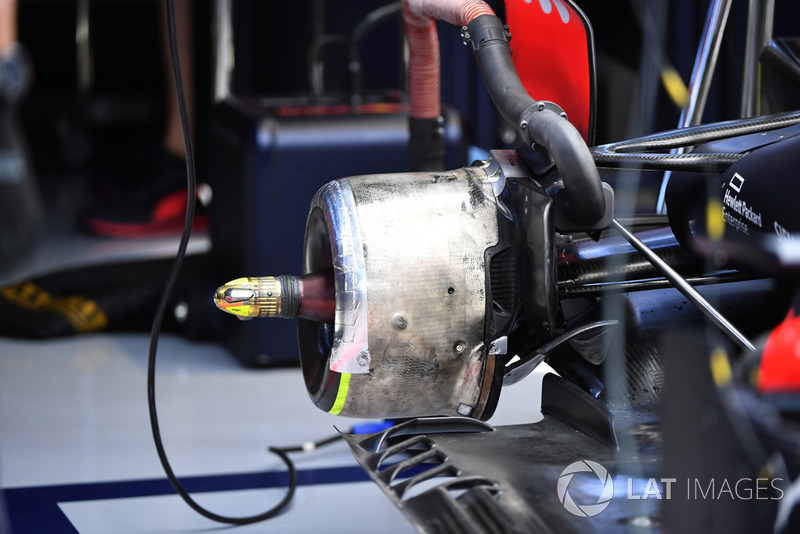 Detached from the power unit, as the team complete a fault-finding exercise, here we can see the intake plenum, which is divided into two for each cylinder bank. 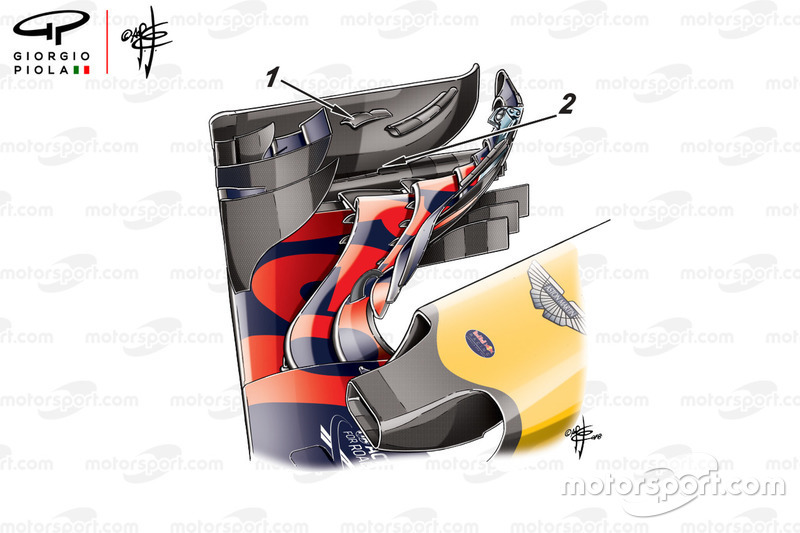 Here we see how Red Bull divided up the airbox in order to feed the engine and associated ancillary coolers. 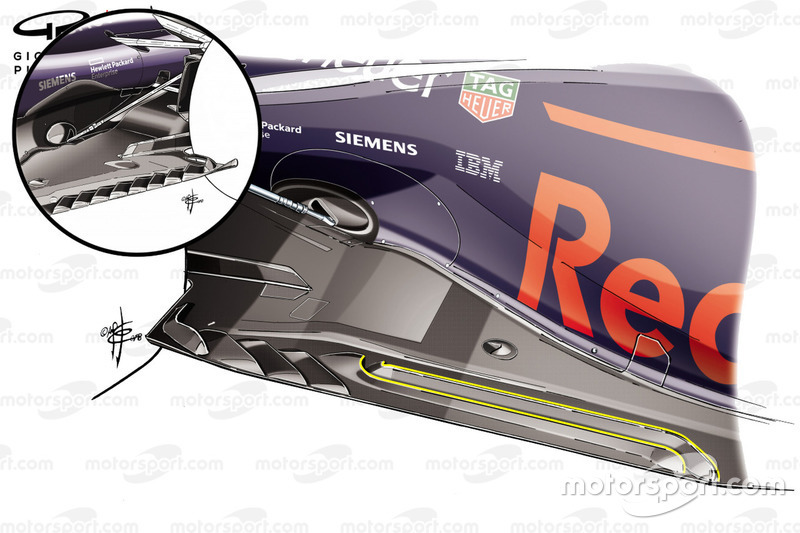 A top-down overview of the RB14 shows how relatively simplistic the team has tried to keep its design. 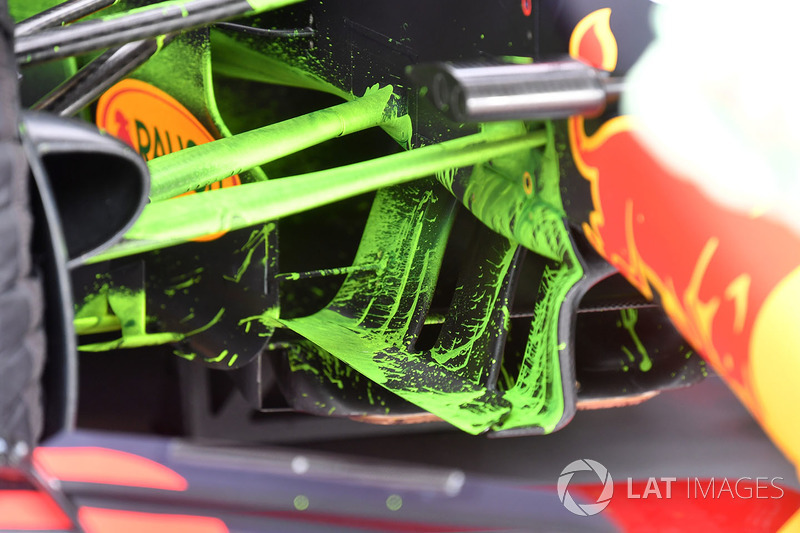 Flo-viz paint sprayed on the underside of the RB14’s chassis, turning vanes and bargeboards. 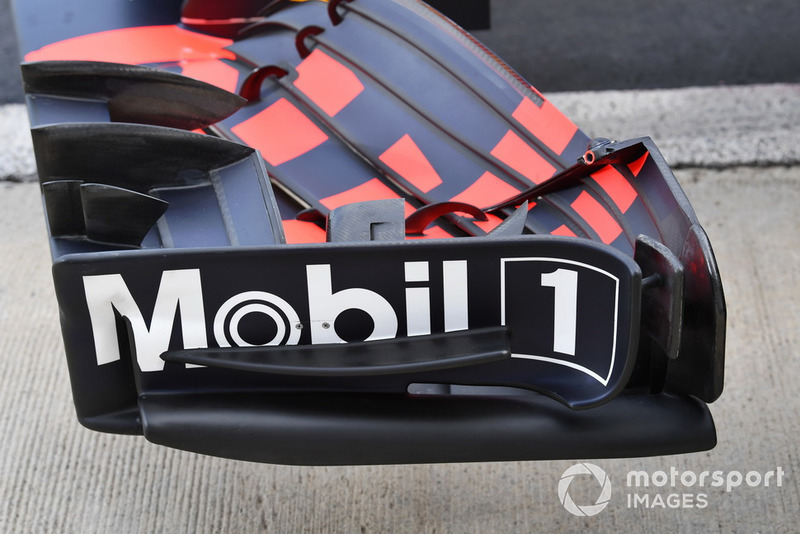 The RB14’s diffuser sprayed with flo-viz during pre-season testing. 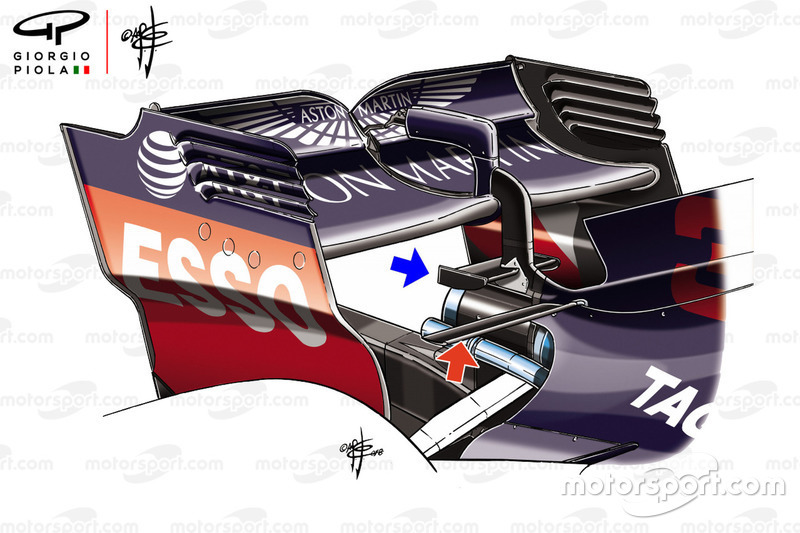 Red Bull used a slender rear wing for the Azerbaijan GP, featuring just two open-end style endplate louvres. 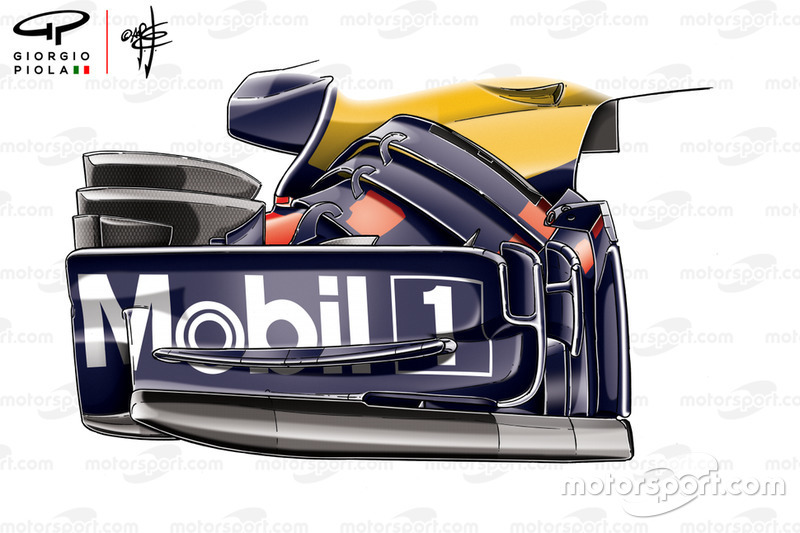 The team made changes to its front wing for the Spanish GP, incorporating a new endplate canard  and revising the shape of the endplates lower extremities . 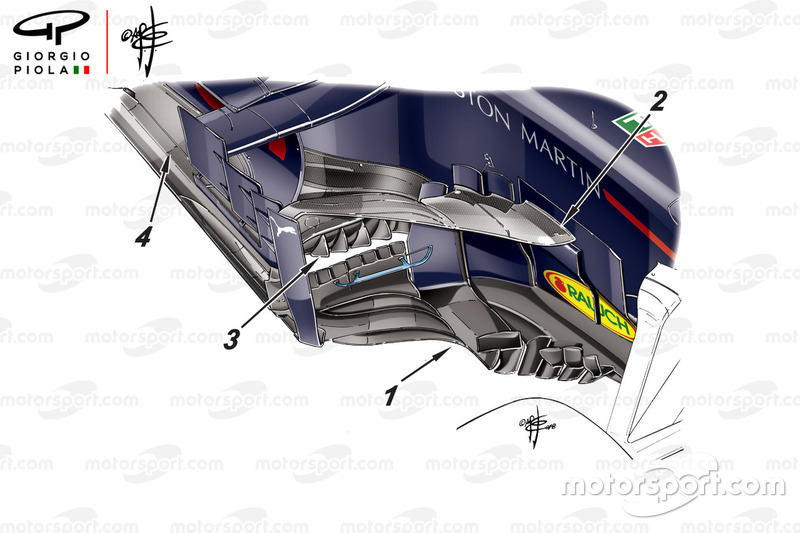 The bargeboard region also got a makeover for the Spanish GP, as the footplates were altered , a boomerang winglet was added , three additional strakes were mounted on the leading edge of the floor, taking the overall count to six and altered the slots in the edge of the floor . 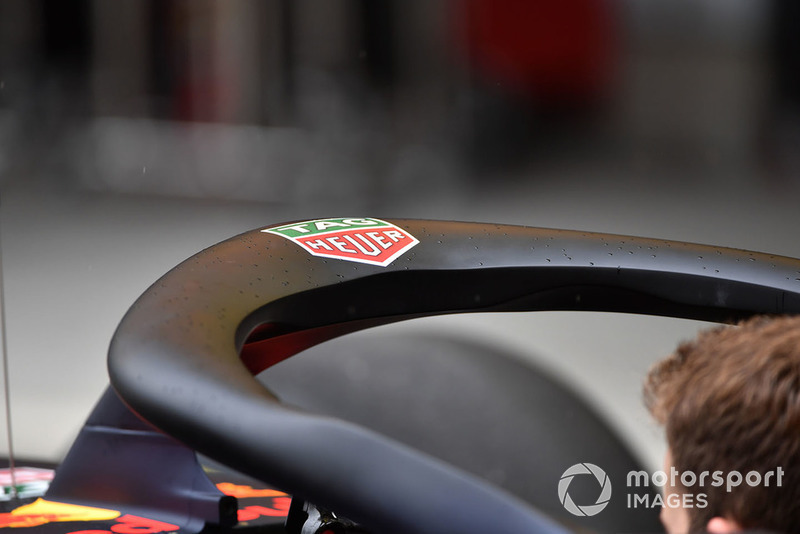 The team also made some adaptations to the RB14’s bargeboards for the French GP, altering the shape and number of the serrations and flaps atop the footplate (arrowed). 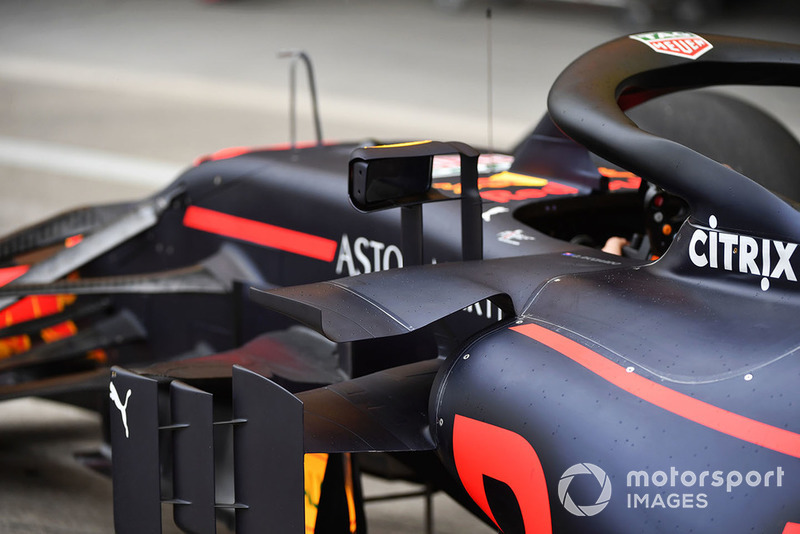 Daniel Ricciardo tried several front wing flap options during the British GP, as the Australian looked to improve the car’s balance. 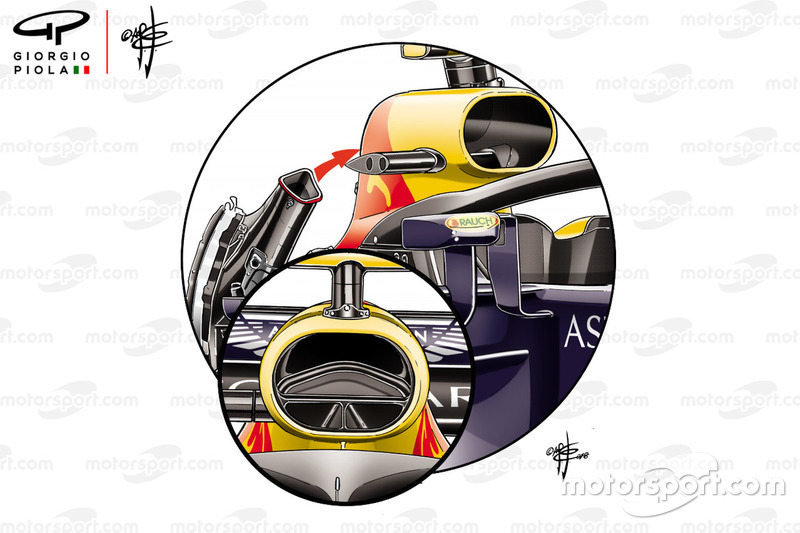 At the German GP the team had a new floor available which made use of long, fully-enclosed holes (highlighted in yellow) in the edge of the floor. The older specification is inset for comparison. 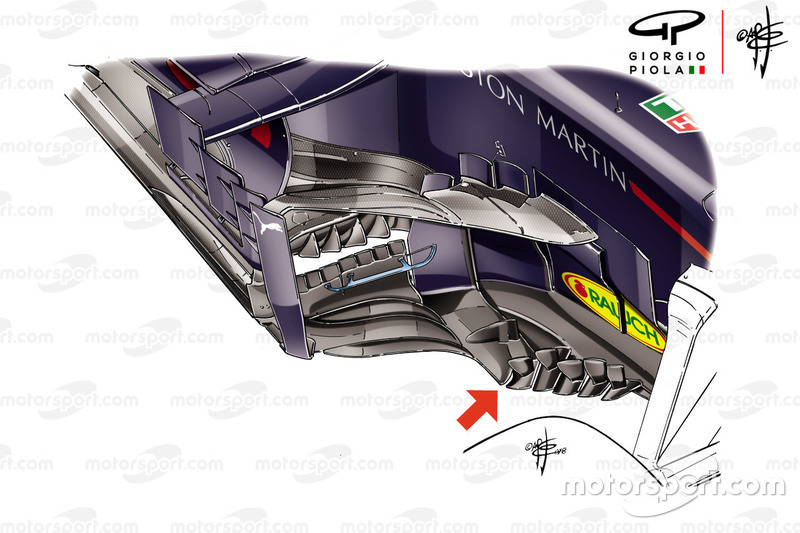 For the Hungarian GP the team opted for an extremely high downforce configuration, which consisted of not only a high angled rear wing but also a wedge-style monkey seat winglet (blue arrow) and single element T-Wing (red arrow). 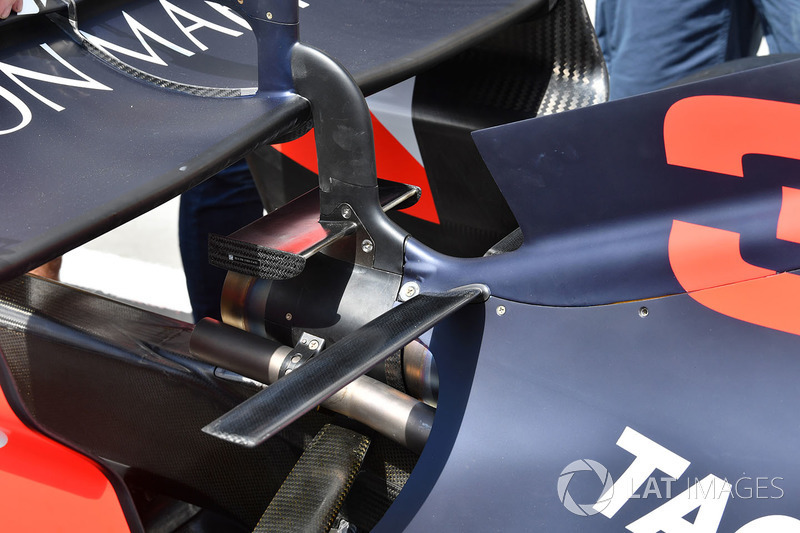 A close up of the monkey seat and T-Wing used in Hungary. 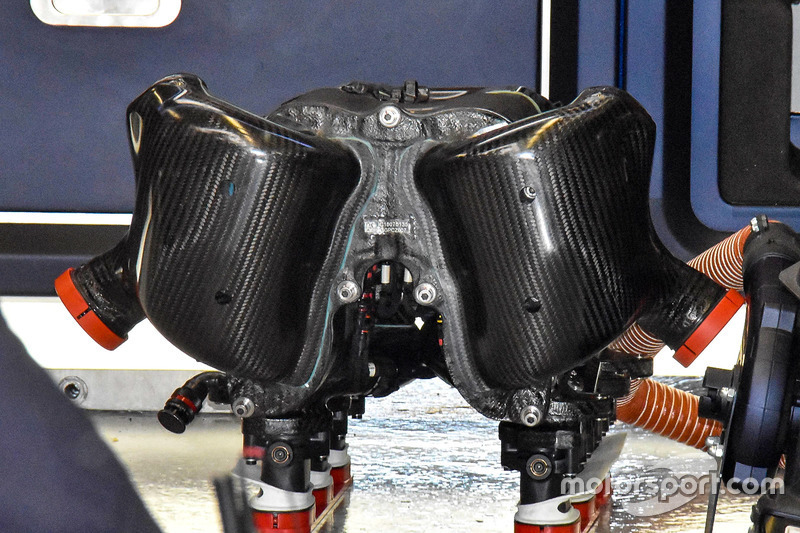 A look at the fully-enclosed longitudinal floor holes that run parallel to the edge of the RB14’s floor. 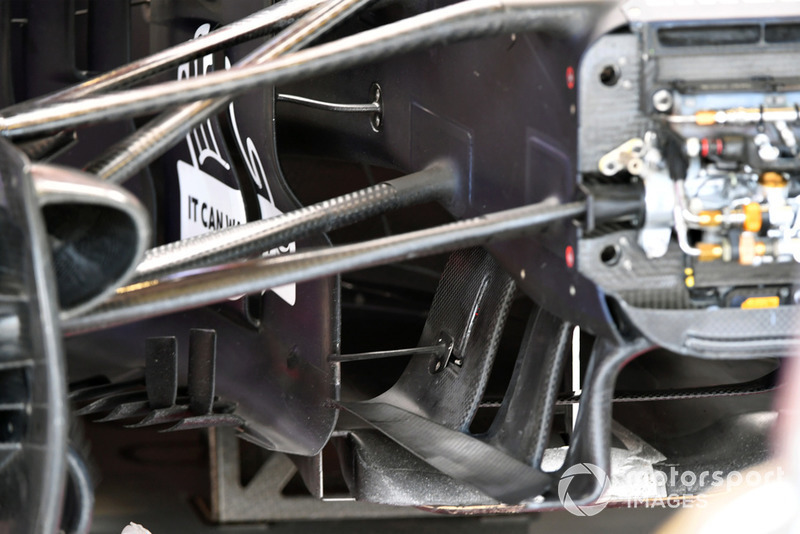 In search of better straightline speed the team opted for this extremely low downforce offering at the Belgian GP. 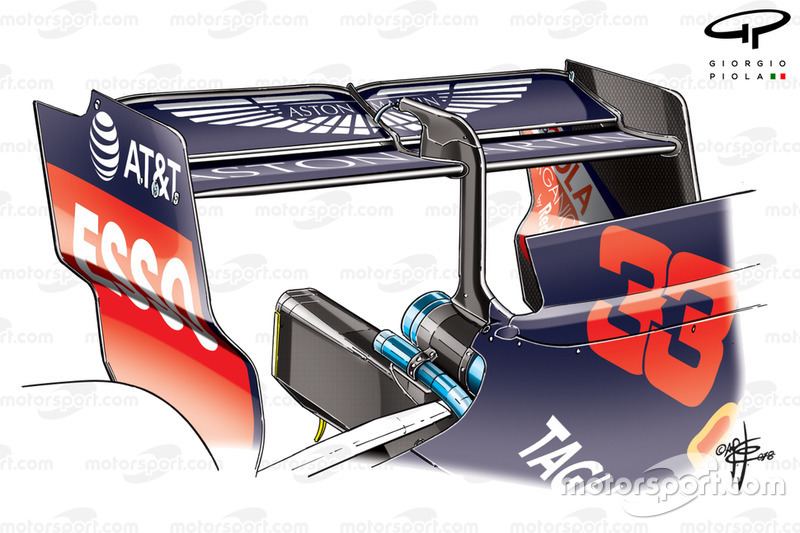 Red Bull also adopted an extremely slender rear wing for the Italian GP, the endplates of which featured no louvres. 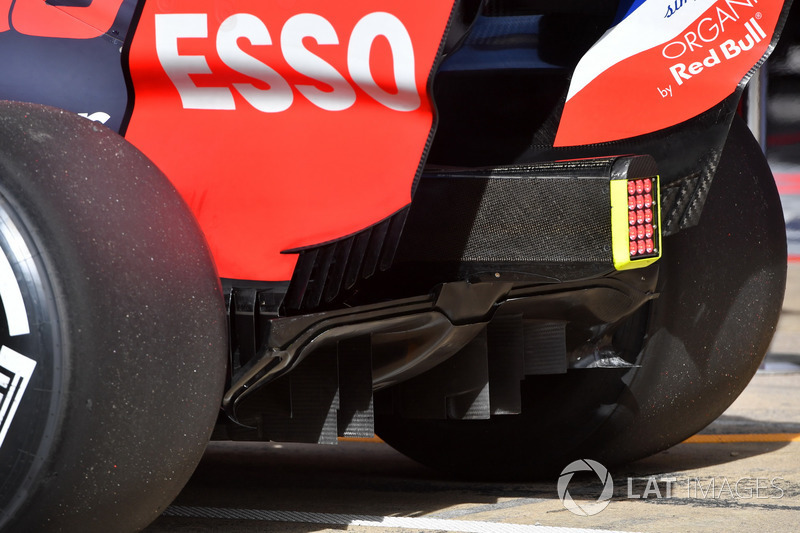 The team amended its front wing design at the Russian GP, creating another slotted element at the rear of the endplate, in order to improve its outwash potential. 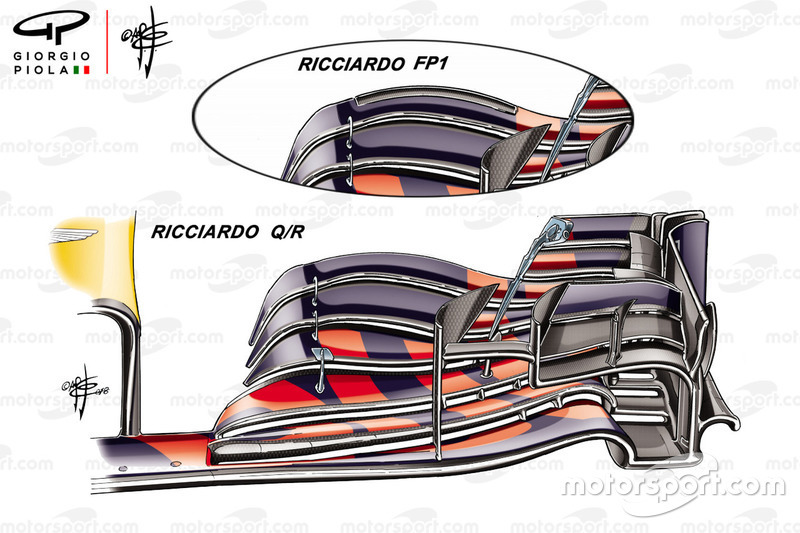 For comparison here is the older specification front wing. 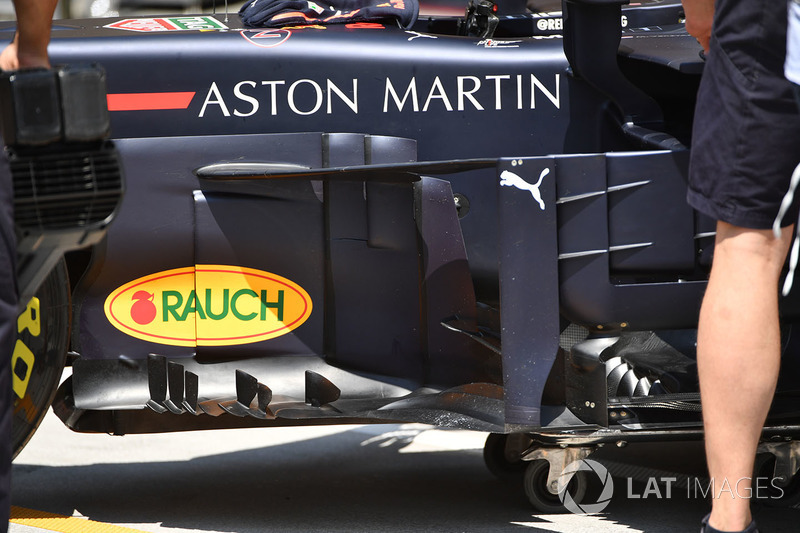 A fantastic view of the RB14’s diffuser at the Russian GP, a design which not only featured a curved outer section but also a subtle curvature as the diffuser arched toward the central section. 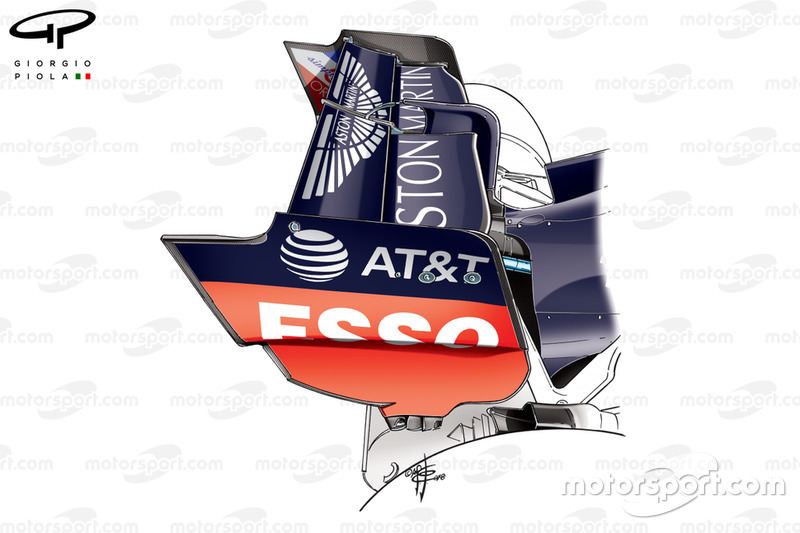 For comparison here’s the diffuser with a squared-off central section. A close up of the two elongated holes added parallel to the floor’s edge. 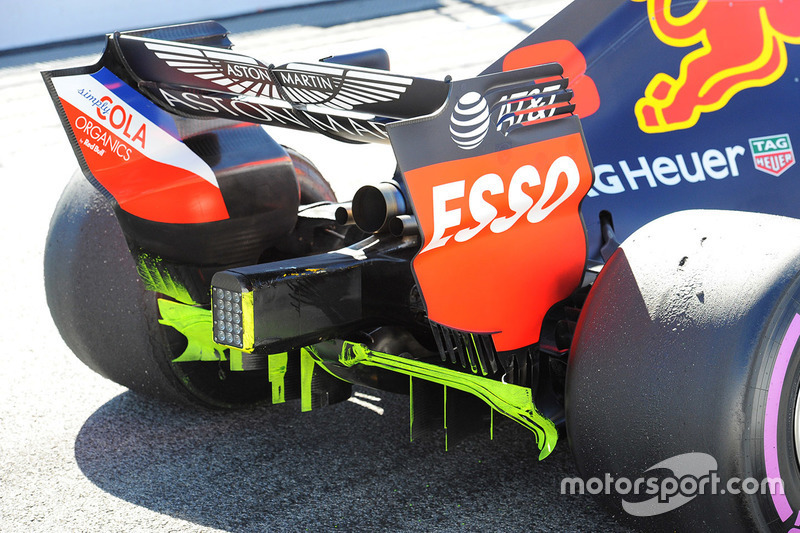 Red Bull trialled this new floor configuration in Mexico, following on from the floor test conducted by Ferrari at the US GP. Both teams were evaluating the use of vertical upstand cascades to enhance the longitudinal floor slots they sat astride. 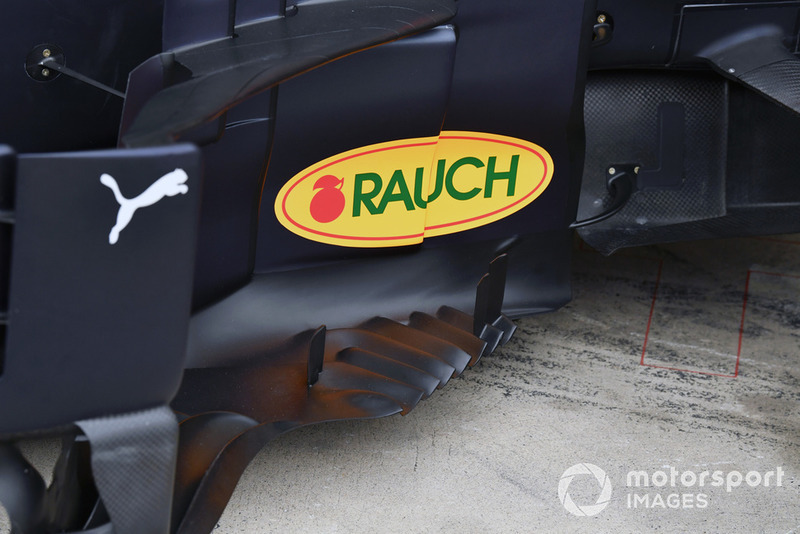 A great view of the RB14’s bargeboard footplate, the complexity of which increased substantially throughout the year. 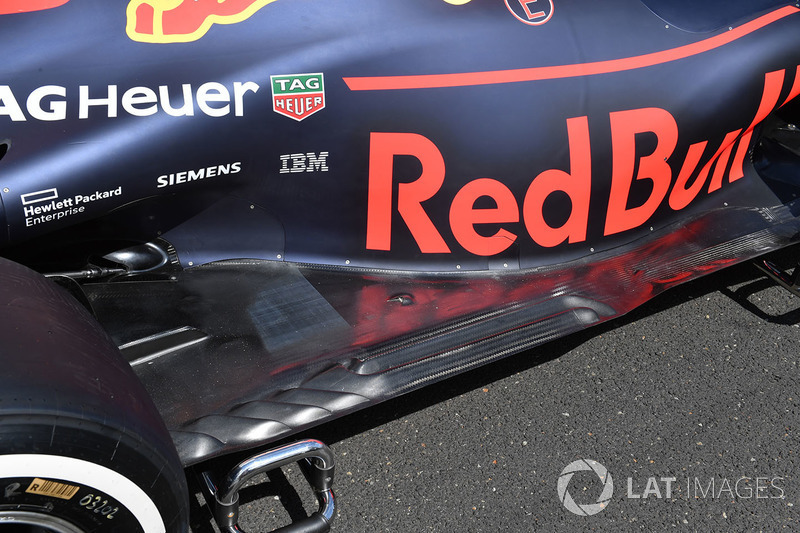 A look at the RB14’s sidepod deflectors at the Brazilian GP.